True hornets are wasps closely related to yellow jackets. These venomous insects with ornery attitudes are members of the genus Vespa. Twenty species comprise the hornet genus. The most common species include the European hornet, the lesser banded hornet, the greater banded hornet, the Yellow-vented hornet and the bicolored hornet. The European hornet (Vespa crabro) is the most widely distributed hornet in the world and the only true hornet in the United States. Introduced to the United States in 1840, its range currently extends from the northeastern states south through Florida and westward toward the Dakotas. European hornets are medium-size -- between 18 and 25 millimeters long, with yellow and reddish-brown markings. They construct large aboveground nests in hollow trees and in suitable nooks in man-made structures such as roofs, sheds and barns. Lesser banded hornets (Vespa affinis) inhabit tropical and subtropical East Asia (see ref 2). Lesser banded queens can reach 30 millimeters in length, while males and other workers in the colony average 24 millimeters. Coloration varies by geography, but these hornets are always black with a brightly colored band across the abdomen. Nest shape also varies by region: nests in tropical regions are pear-shaped, while nests in subtropical areas are typically oval with rounded tops. The greater banded hornet (Vespa tropica) is another hornet widely distributed throughout tropical Asia. 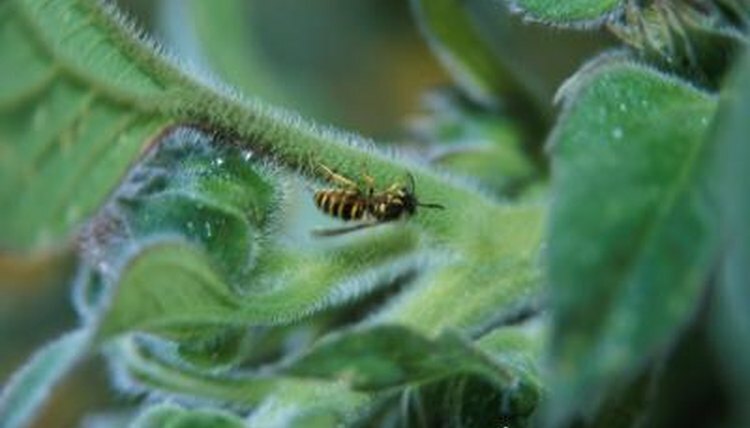 Roughly the same size as lesser banded hornets, the greater banded variety appears less aggressive than their counterparts. This hornet species with the bright yellowish-orange abdominal band is rather secretive, preferring to build their nests underground or in an enclosed space, and fly under the cover of foliage. Yellow-vented hornets (Vespa analis) are a medium- to large-sized species that occupy much of Asia including Japan and Russia. This makes them among the most widely distributed hornet species in the world. Variable in color and pattern, the most common variety is almost completely black with a tip of yellow at the base of the abdomen. They prefer to dwell high, though not substantially high, in the trees, building their nests 6 to 10 feet above the ground. The bicolored hornet (Vespa bicolor) is common in China, Thailand, Vietnam and Cambodia. These bright yellow hornets are the smallest species in China and are among the most social of all hornet species. Other less common hornets include Vespa basalis, Vespa binghami, Vespa ducalis, Vespa dybowskii, Vespa fervida, Vespa mandarinia, Vespa orientalis, Vespa philippinensis, Vespa simillima, Vespa soror and Vespa velutina. All of them are indigenous to Asia.